زعفران (Crocus sativus L.) گیاهی چند ساله است که اساساً در نواحی خشک و نیمه‌خشک کشور رویش دارد. علیرغم سازگاری زعفران به این نواحی، ارزیابی روند تغییرات سطح زیر کشت زعفران در طی 30 سال اخیر نشان می‌دهد که کشت این محصول افزایش قابل‌توجهی یافته است؛ به‌طوری که زعفران هم‌اکنون در 21 استان کشور در سطحی معادل 88 هزار هکتار کشت می­شود. با این وجود، در بین سال­های 1360 تا 1393 عملکرد زعفران به ازای هر واحد سطح زیر کشت کاهش محسوسی یافته است. به‌طوری که از 1/5 کیلوگرم در سال 1360 به 2/3 کیلوگرم در سال 1393 رسیده است. کاهش عملکرد زعفران از جنبه­های متفاوتی اتفاق افتاده و اساساً متأثر از عواملی مانند سوء مدیریت در بخش کشاورزی، اقتصادی، فرآوری پس از برداشت و نیز خشک‌سالی‌های اخیر بوده است. در صورت عدم توجه به عوامل ذکرشده، عملکرد زعفران در سال­های آینده نیز ممکن است بیش از پیش کاهش یابد. کاهش عملکرد زعفران در طی 30 سال اخیر، لزوم ارائه یک برنامه جامع از سوی نهادهای مرتبط با زعفران شامل دانشگاه­ها، مؤسسات تحقیقاتی و نیز سازمان تحقیقات، آموزش و ترویج کشاورزی را بیش از پیش مورد تأکید قرار می­دهد. همچنین جهت تدوین و توسعه این برنامه، اتخاذ سیاست­های دولت جهت برنامه­ریزی و تصویب بودجه موردنیاز ضروری به نظر می­رسد. در این مقاله مروری ابتدا سعی بر آن است تا مجموعه دلایل مرتبط با کاهش عملکرد زعفران مورد مطالعه قرار گیرد. ارائه راهکارهای لازم در ارتباط با این دلایل، هدف بعدی در مقاله می­باشد. Saffron (Crocus sativus L.) is a perennial plant which grows basically in arid and semi-arid regions of Iran. Despite saffron’s adaptation to these regions, the assessment of changes in cultivation area over the last 30 years reveals that cultivation of this crop has sharply increased. According to the available statistics, there are 21 provinces where saffron is cultivated on about 84,000 hectares of land. Nonetheless, saffron yield per unit area has aggressively fallen from 5.1 kg ha-1 in 1982 to 3.2 kg ha-1 in 2015. Saffron yield loss can be caused by several factors, such as mismanagement in agriculture section, economics and post-harvest processing as well as the recent droughts. Lack of attention to these factors could lead to further decline in saffron yield in the future. The saffron yield loss over the last 30 years is an alert for saffron-related institutions such as the universities, research centers and Agricultural Research, Education and Extension Organization (AREEO) to pay more attention to this crop and prepare more comprehensive programs. In developing these programs, the importance of government policies for planning and approving enough budget is to be highlighted. In this review, first we focus on the reasons for saffron yield loss during the last 30 years and then we try to provide some solutions in relation to these reasons. Abasi, K, Almassi, M., Borghaei, A., and Minaee, S. 2014. Modeling of yield estimation for the main crops in Iran based on mechanization index. Journal of Agricultural Machinery 4: 344-351. (In Persian with English Summary). Aghaei, M., and Rezagholizadeh, M. 2011. Iran's comparative advantage in production of saffron. Journal of Agricultural Economics and Development 25:121-132. (In Persian with English Summary). Agricultural statistics. 2015. Department of Planning and Economy (from 2002 to 2015). http://www.maj.ir/. Alizadeh, A., Sayari, N., Ahmadian, J., and Mohamadian, A. 2009. Study for zoning the most appropriate time of irrigation of saffron (Crocus Sativus) in Khorasan Razavi, north and southern provinces. Journal of Water and Soil 23: 109–118. (In Persian with English Summary). Atefi, M., Akbari Oghaz, A.R., and Mehri, A. 2013. Drying effects on chemical and sensorial characteristics of saffron. Iranian Journal of Nutrition Sciences and Food Technology 8: 201-208. (In Persian with English Summary). Azizi-Zohan, A.A., Kamgar-Haghighi, A.A., and Sepaskhah, A.R. 2009. Saffron (Crocus sativus L.) production as influenced by rainfall, irrigation method and intervals. Archives of Agronomy and Soil Science 55: 547–555. Badri, S.B., Eftekhari, A.R., Salmani, M., and Behmand, D. 2011. The role of family farming system on sustainable rural Development (Case study: Ghir and Karzin County - Fars province). Human Geography Research Quarterly 76: 33-48. (In Persian with English Summary). Bani Asadi, M., and Varmaziyari, H. 2015. Investigation of effective factors on agricultural labor productivity, income distribution and poverty in rural areas of Iran. Journal of Village and Development 17: 1-23. (In Persian with English Summary). FAO, 2014. Food and Agriculture Organization of the United Nations. http://www.faostat.fao.org. Kafi, M., Rashed Mohasel, M.H., Koocheki, A., and Mollafilabi, A. 2002. Saffron, Production and Processing. Ferdowsi University of Mashhad Press. (In Persian). Keykhamoghadam, P., Kamgar Haghighi, A., Sepaskhah, A., and Zand Parsa, S. 2013. Determination of Single and dual crop coefficients and potential evapotranspiration of developed saffron. Journal of Agricultural Meteorology 1: 1–9. (In Persian with English Summary). Khazaei, M., Monfared, M., Kamgar Haghighi, A.A., and Sepaskhah, A.R. 2013. The trend of change for weight and number of saffron corms as affected by irrigation frequency and method in different years. Journal of Saffron Research 1: 48–56. (In Persian with English Summary). Koocheki A., Nassiri Mahallati, M., Zarea Fizabadi, A., and Jahanbin, M. 2005. Diversity of cropping systems in Iran. Pajouhesh and Sazandegi 63: 70–83. (In Persian with English Summary). Koocheki, A., and Seyyedi, S.M. 2015. Relationship between nitrogen and phosphorus use efficiency in saffron (Crocus sativus L.) as affected by mother corm size and fertilization. Industrial Crops and Products 71: 128–137. Koocheki, A., Nassiri, M., Alizadeh, A., and Ganjali, A. 2010. Modelling the impact of climate change on flowering behaviour of Saffron (Crocus sativus L.). Iranian Journal of Field Crops Research 7: 583–594. (In Persian with English Summary). Koocheki, A., Rezvani Moghaddam, P., Mollafilabi, A., and Seyyedi, S.M. 2012a. Effects of high corm planting density and applying manure on flower and corm yields of saffron (Crocus sativus L.). 4th International Saffron Symposium: Advanced in Saffron Biology Technology and Trade. 22–25 October 2012. Koocheki, A., Seyyedi, S.M., and Gharaei, S. 2016. Evaluation of the effects of saffron-cumin intercropping on growth, quality and land equivalent ratio under semi-arid conditions. Scientia Horticulturae 201: 190–198. Koocheki, A., Seyyedi, S.M., and Jamshid Eyni, M. 2014. Irrigation levels and dense planting affect flower yield and phosphorus concentration of saffron corms under semi-arid region of Mashhad, Northeast Iran. Scientia Horticulturae 180: 147–155. Koocheki, A., Siahmarguee, A., Azizi, G., and Jahani, M. 2011. The effect of high density and depth of planting on agronomic characteristic of Saffron (Crocus sativus L.) and corms behavior. Journal of Agroecology 3: 36–49. (In Persian with English Summary). Koocheki, A., Tabrizi, L., Jahani, M., and Mohammad Abadi, A.A. 2012b. An evaluation of the effect of saffron (Crocus sativus L.) corm planting rate and pattern on the crop's performance. 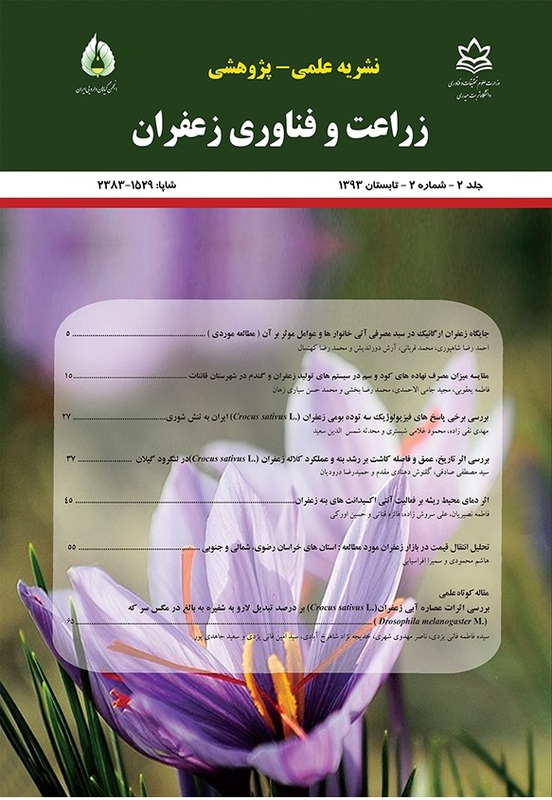 Iranian Journal of Horticultural Science 42: 379-391. (In Persian with English Summary). Mazloumi, M.T., Taslimi, A., Jamshidi, E., Atefi, M., Haj Seyyed Javadi, N., Komeili Phanoud, R., Seyyed Ahmadian, F., Falahatpishe, H., Chobdar, N., Hadian, Z., Golestan, B., and Shafighi, S.A. 2007. Comparison of the effects of vacuum oven-, freeze-, solar-, and microwave-drying with traditional drying methods on the qualitative characteristics of Ghaen saffron. Iranian Journal of Nutrition Sciences and Food Technology 2: 69-76. (In Persian with English Summary). Ministry of Agriculture Jihad, 2015. Agriculture Jahad Mechanization Development Center. http://www.agmdc.ir. Molina, R.V., García-Luis, A., Coll, V., Ferrer, C., Valero, M., Navarro, Y., and Guardiola, J.L. 2004. Flower formation in the saffron Crocus (Crocus sativus L.). The role of temperature. Acta Horticulturae 650 (First International Symposium on Saffron Biology and Biotechnology): 39–48. Molina, R.V., Valero, M., Navarro, Y., Guardiola, J.L., and Garcia-Luis, A. 2005. Temperature effects on flower formation in saffron (Crocus sativus L.). Scientia Horticulturae 103: 361–379. Motiei Langroudi, S.H., Rezvani, M., Faraji Sabokbar, H.A., and Khajeh Shahkouhi, A. 2011. Analysis of sustainability of family and rural production cooperative farming systems (Case study: Agh-Ghala Township: Golestan province). Iranian Journal of Agricultural Economics and Development Research 41: 323-333. (In Persian with English Summary). Naderi Mayoun, R. 2012. The influence of agricultural mechanization on yield and waste reduction production of rice (The Atrak village Shalikaran of Moneh and Samal ghan of north Khorasan). Quarterly Journal of Human Geography 3: 1-16. (In Persian with English Summary). Nassiri Mahallati, M., Koocheki A., Rezvani Moghaddam P., and Beheshti A. 2008. Agroecology. Ferdowsi University of Mashhad Press. (In Persian). Rabiei, H., Salarpour, M., and Sabouhi Sabon, M. 2013. Effect of macroeconomic variables on the Iran agricultural sector income. Journal of Agricultural Economics Researches 4: 65-85. (In Persian with English Summary). Rezvani Moghaddam, P., Koocheki, A., Molafilabi, A., and Seyyedi, S.M. 2013a. Effect of biological and chemical fertilizers on replacement corm and flower yield of saffron (Crocus sativus L.). Iranian Journal of Crop Sciences 15: 234–246. (In Persian with English Summary). Rezvani Moghaddam, P., Koocheki, A., Molafilabi, A., and Seyyedi, S.M. 2013b. The effects of different levels of applied wheat straw in different dates on saffron (Crocus sativus L.) daughter corms and flower initiation criteria in the second year. Saffron Agronomy and Technology 1: 55–70. (In Persian with English Summary). Sabet Teimouri, M., Kafi, M., Avarseji, Z., and Orooji, K. 2010. Effect of drought stress, corm size and corm tunic on morphoecophysiological characteristics of saffron (Crocus sativus L.) in greenhouse conditions. Journal of Agroecology 2: 323–334. (In Persian with English Summary). Salimifar, M., and Norouzi, R. 2008. A changing trend of socio-economic inequalities in rural and urban areas in Iran (1966-2006). Knowledge and Development 24: 37-61. (In Persian with English Summary). Sepaskhah, A.R., and Kamgar-Haghighi, A.A. 2009. Saffron irrigation regime. International Journal of Plant Production 3: 1–16. Taslimi, A., Mazloumi, M.T., and Jamshidi, E. 2007. Comparison of the effects of solar drying and vacuum processes with traditional methods on properties of saffron. Iranian Journal of Nutrition Sciences and Food Technology 3: 9-18. (In Persian with English Summary). Torkamani, J., and Azin Far, Y. 2006. The effect of exports and mechanization growth on labor employment in agriculture. Iranian Journal of Agricultural Sciences 36: 1223-1231. (In Persian with English Summary). Yarami, N., Kamgar-Haghighi, A.A., Sepaskhah, A.R., and Zand-Parsa, S. 2011. Determination of the potential evapotranspiration and crop coefficient for saffron using a water-balance lysimeter. Archives of Agronomy and Soil Science 57: 727–740.